"From the planning stages to the rehearsal dinner, ceremony space and reception, Crissey Farm in Great Barrington, Massachusetts with Gary, Chelsea, and staff prepared an absolutely fabulous wedding for Dan and Kaity. It was just perfect and exactly as they had hoped. In their words, "it went beyond their expectations". Gary listened to and understood Kaity and Dan's vision for the day and definitely made it happen. The venue with both outdoor space and indoor space with a rustic flair was perfect. The staff was friendly, efficient, and on top of things at all times. The food was outstanding - fantastic presentation, excellent menu options, and absolutely delicious. There was never a lack of food and stations were replenished rapidly. The transitions between appetizers, dinner foods and desserts were so professional and smooth. People raved about the appetizers, then again about the dinner food and then came the desserts which sent everyone over the top with all the choices of small dessert items all homemade. We had a few guests who are foodies and well versed in the food preparation world, and they were so impressed. Now that is a compliment!!! Of course, the bar with both alcoholic and non alcoholic refreshments was available with friendly staff and never a wait for a drink. We cannot say enough positives about Crissey Farm, their staff and everything they did to make this the most perfect wedding day for Dan and Kaity and of course for us as parents. This is what they dreamed about and planned for and Gary, staff and Crissey Farm nailed it !!! Congratulations to Gary and Crissey Farm for a job well done. We would HIGHLY recommend Crissey Farm for all the above reasons. Thank you." I was lucky enough to find Crissey Farm while doing an internet search for reception venues. We had both our ceremony and reception at Crissey Farm; and they handled the catering, bar, and cake. The owner, Gary Happ, was so welcoming and helpful; Chef Odille Carpenter is phenomenal; the staff is great; and the Berkshires backdrop is breathtaking! Great food, great people; you can't go wrong! I've heard such positive reactions from all of our guests. Everyone loved the food and the venue. We are so pleased with our decision to get married at Crissey Farm (it was the only place we looked at), and would recommend it to anyone looking for a down-to-earth, warm, and elegant setting. 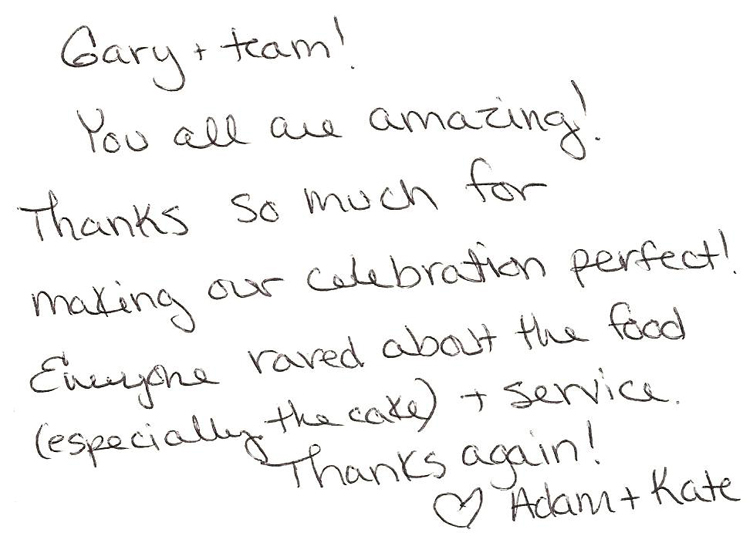 "We are extremely grateful to the entire staff of Crissey Farm for making our wedding day so special. They completely understood our vision for the day and ran with it. Everything came out better than we could have ever imagined. They totally exceeded our expectations. The food was amazing....our guests are still raving about it! Gary and his staff accommodated our every request with professionalism, patience, and understanding. We can't wait to have another event there!"